Insights on system design interviews. Knowledge test. Experience test. An overview of important technologies used in internet application companies. Concepts of servers, data centers, http(s) communication, RPC communication, testing, protocol buffer, load balancing, QPS, databases, map reduce. Testing — Is it political correct in the programing world? Unit tests, integration tests, mocking, test flakiness. How to write good unit tests. Data centers, machines, server jobs, load balancing. Life of a query, http(s) requests, RPC requests, protocol buffers. Why NoSQL DBs are so popular? Performance, Availability, Consistency. A detailed analysis of bigtable and its pros and cons. NoSQL database Schema design. Map reduce, its theory and design. Applications that are suitable for map reduce. 第四课System design interview questions analysis. Three steps to beat the system design interviews. 3. Analyze the life cycle of the operations. 这里会讲解如何应用前面几节课的知识来应对具体的面试题目。One class can typically cover 3-4 interview questions in depth. 第五课This class will go through common design patterns and explain how they are used in the real world software development. How Singleton pattern is used? How publisher and subscriber pattern is used? How dependency graph is used? How scheduled refresh job can be implemented. 第六课System design interview questions analysis. 3-4 questions will be analyzed in depth. 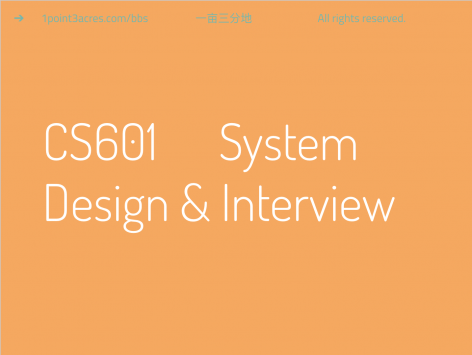 第七课System design interview questions analysis.